A few years ago scientists discovered they could reduce the formation of nitrogen oxides (NOx) during combustion by keeping combustion temperatures below about 2500 degrees F. They did this by injecting an inert (non burning) gas into the air/fuel mixture of the engine. The inert gas helps cool the combustion event to below the threshold where NOx are formed. It turned out that exhaust gas works well as an inert gas. The EGR valve allows a metered amount of exhaust to enter the intake of the RX-7's engine. An ECU controlled solenoid controls vacuum to the EGR. The valve is closed with no vacuum, open with vacuum. The chart on page F-125 of the Mazda 3rg gen Workshop Manual shows that the EGR valve only opens under relatively light loads between 1050 and 3850 rpm. It is closed at idle, deceleration, rpm above 3850, and heavy load. So it seems that there would be little benefit in disabling the system. The emission book, "Understanding Automotive Emissions Control," states that an engine may need it's timing retarded and/or the air/fuel mixture richened to prevent detonation but since the RX-7's valve is closed under wide open throttle we don't need our mixture richened. I've heard from several list members that have disabled the valve with no apparent change in engine operation. This mod is for off road use (racing) only, it is not legal for public highway use vehicles. The Exhaust Gas Recirculation valve can be easily disabled on 93 non-California spec cars by simply plugging or removing its vacuum line. I decided to disable mine in the hopes of prolonging its life so it won't stick open (bad) and cause problems. If it's needed in the future to pass emissions I'll reinstall the vacuum hose. California spec cars and cars manufactured in 1994 have an electrical sensor on the EGR valve that reports the valve's position to the ECU that will cause the Check Engine light to illuminate if you disable it. To get around this you have to remove the valve and and fabricate a blocking plate to place between the EGR valve and its mounting hole on the lower intake manifold. This allows the valve to open and close but not inject any exhaust gas into the intake. Just buy a sheet of aluminum from a hardware store and cut the plate using tin snips. 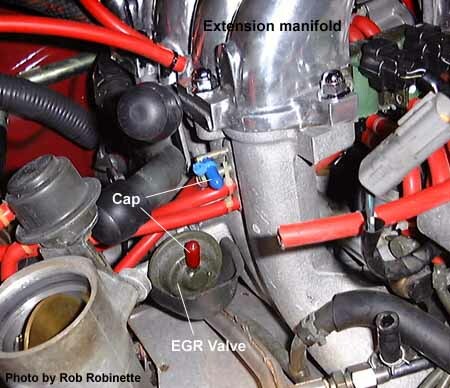 Use the EGR valve itself as the template. See the Replace EGR how-to. For cars without the EGR electrical connector (like mine, see picture above), the EGR valve is very easy to disable. The valve is located just above the down-pipe on the lower intake manifold. To get to the valve you'll have to remove the black plastic crossover tube that runs from the Y-pipe to the intercooler. With the crossover tube off you'll be able to remove and plug it's vacuum line. You could also just pinch it shut with a heavy duty paper clip. I chose to remove the vacuum line and cap the ends (see photo).